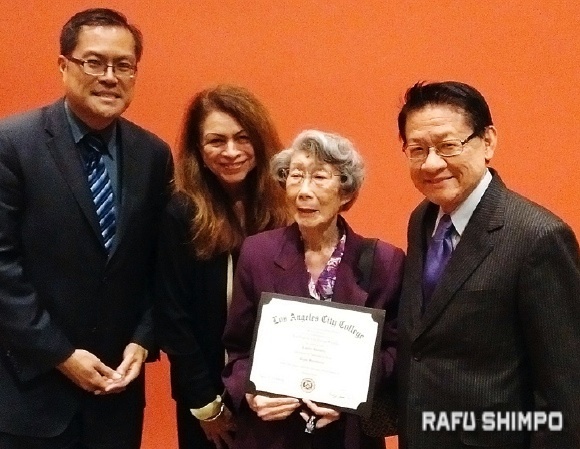 The Los Angeles Community College Board of Trustees awarded an honorary associate of arts degree in liberal studies to former student Kimiko Umemoto Kishi, 95, on Feb. 8 as her family, students, staff, faculty and administrators gave her a standing ovation. LACC’s authority to grant this degree originated with Assembly Bill 27, authored by former Assemblymember Warren Furutani when he discovered that over 2,500 Japanese American students were prevented from graduating from California colleges due to Executive Order 9066, issued on Feb. 19, 1942. Furutani’s legislation allowed state colleges and universities to belatedly grant the degrees that were denied to those students. “In 1942, Kimiko Umemoto was a typical student at the downtown Los Angeles City College, studying to get her associate of arts degree and ready to embark on her young career in a world full of unlimited opportunity,” said LACC Trustee Mike Eng. “But in February, President Franklin Roosevelt signed Executive Order 9066, which resulted in the forcible removal and incarceration of 120,000 mainly persons of Japanese ancestry notwithstanding U.S. citizenship status. “Kimiko’s college career was immediately severed from her as she was shipped off to one of America’s concentration camps, never to return to the college that once held the promise of the American dream. “Who knows what would have happened had she remained? Would she have become as accomplished as architect Frank Gehry, who designed the iconic downtown Disney Concert Hall and many other structures, or Clint Eastwood, the actor turned director and producer, both graduates of L.A. City College? LACC President Renee Martinez was among the officials participating in the ceremony. Born to Japanese immigrant parents in January 1922 in Los Angeles, Kishi graduated from John Marshall High School in 1940 and began her studies at nearby LACC in the fall of 1940. She studied business, secretarial classes and planned to work as a secretary. “After Pearl Harbor there was a great deal of concern because of all the anti-Japanese sentiment, but she thought since she was born in the U.S. and was a citizen she would not have anything to fear,” her daughter Susan said. “Her parents both worked and had been in this country over 20 years; they all considered Los Angeles their home. They had no allegiance to Japan. In August 1942, Kishi and her family were sent to the Heart Mountain camp in Wyoming, where she used her secretarial skills in her job as the assistant to the block manager. She was able to leave Heart Mountain before the end of the war to go to work as a church secretary in Minneapolis, where she met her future husband, Fred. “He had been at an internment camp in Colorado and had been helped to leave to continue his college education at the University of Maryland,” the daughter explained. “The American Friends Service Committee and the Japanese American Student Relocation Council helped more than 4,000 students continue their college education. While in college he was drafted — yes, while his parents were interned — and was sent to Fort Snelling, St. Paul, Minn., for Military Intelligence Language training. After her children were grown, Kishi took courses at Merced Community College, but not to obtain a degree. The family was unaware of the Nisei diploma bill, which was signed into law by Gov. Arnold Schwarzenegger in 2009. But the 75th anniversary of Pearl Harbor last December brought back a lot of memories for Kishi, and her daughters thought that an honorary AA degree would be a great birthday present (she turned 95 in January). She initially said she didn’t think she needed the diploma because it all happened so long ago, but she changed her mind and looked forward to receiving it. The trip to Los Angeles was also an opportunity to see her two sisters, also in their 90s. “Our family feels strongly people need to be reminded of the mass forced incarceration that happened 75 years ago and not allow it to happen again. The political climate now makes us concerned our country has not learned from its past mistakes. The hateful language and acts against immigrants, talk of a Muslim registry, an executive order banning Muslims from entering this country are all actions which run counter to what we believe our country stands for, civil liberties and human rights for all.